I saw a photo of this while thumbing through books at a local bookstore, and I just had to research and share. Only in bygone times of mad kings and laboring serfs could such a place be built. Come with me now on a journey through time and insanity. 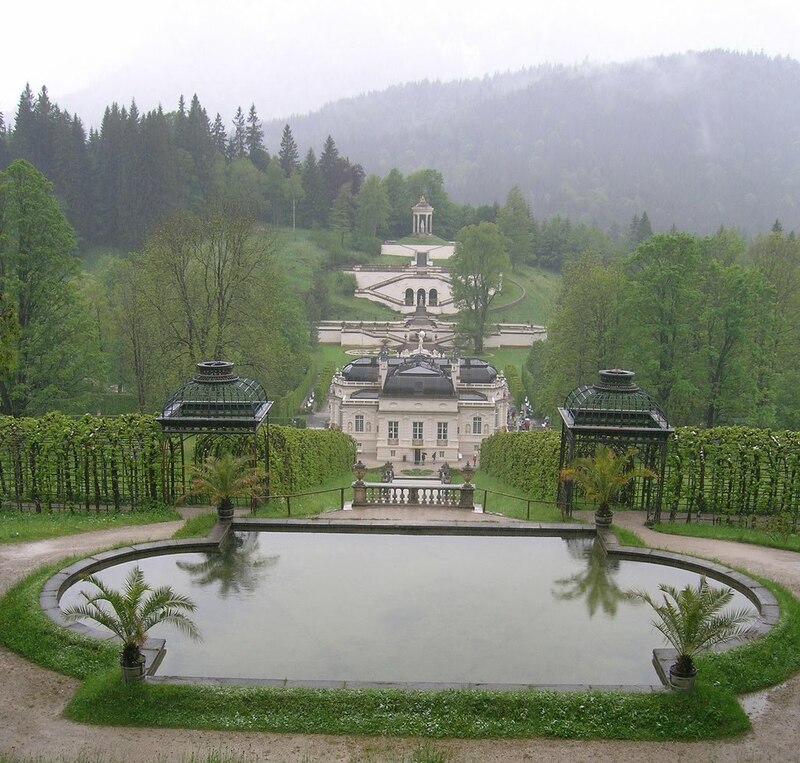 The “Mad King” Ludwig II of Bavaria ordered the construction of three palaces, but he only lived to see one. The first completed and the smallest, Linderhof Castle features some of the most eccentric features you can imagine and what some consider to be among the best of palace garden design. 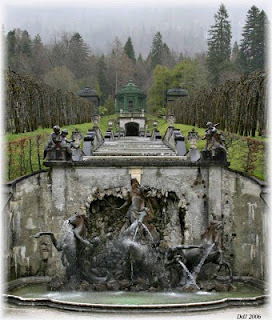 Assuming the throne at the tender age of eighteen in the year eighteen hundred and sixty-four, Ludwig Friedrich Wilhelm was young, handsome, and full of fantasy and imagination. While he is now referenced as the “Mad King,” his original monikers were “Swan King” and “Fairy Tale King.” It is believed that he was more eccentric, soulful, and artsy than insane, but he was deposed on the grounds of mental illness, and history is written by the victors. 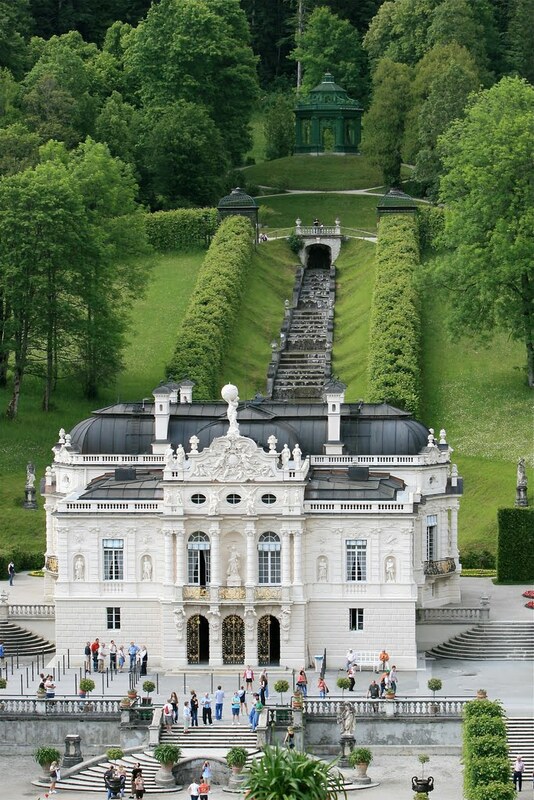 Ludwig tore down the original structure, Königshäuschen, to build his palace in eighteen hundred and seventy-four. 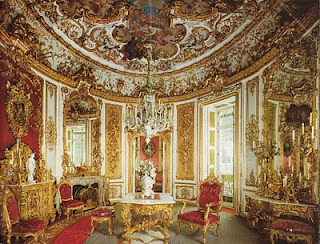 It was designed, for those who understand the references, in the style of the rococo period and modeled after the palace of Versailles (built for Louis XIV). The also-very-eccentric King Louis XIV was somewhat of an idol to the young King Ludwig II, though whereas Louis XIV considered himself the Sun King, Ludwig II instead fancied himself the Night King. 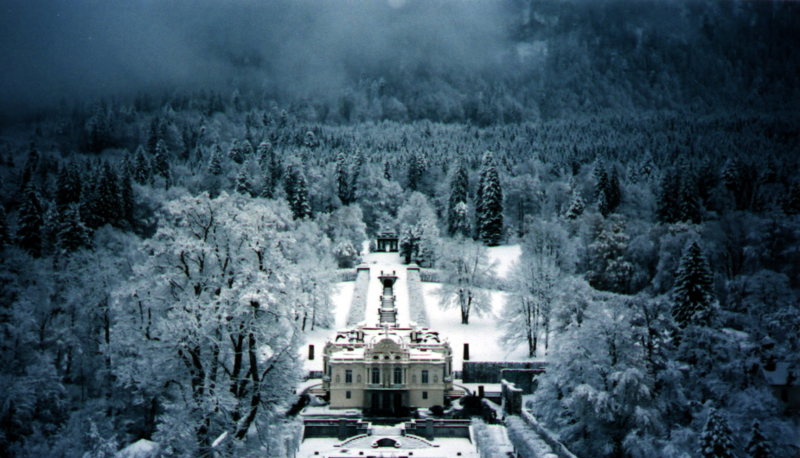 As any true Night King would (I sure did when I thought I was a Night King), Ludwig II slept through the day and awakened at night. 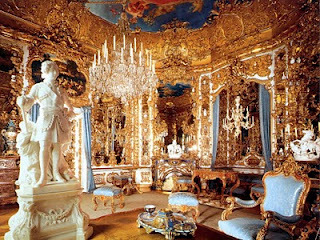 To solve the problem of lighting, he spent a great deal of his time in the Hall of Mirrors – a room, as you might imagine, filled with mirrors. The already-abundant candlelight was nearly infinitely reflected in this room, giving him ample light by which to read and entertain himself. Straddling the line between eccentricity and madness, it is said that King Ludwig II demanded four settings at his Dining Room table despite the fact that he dined alone. The story goes that he would hold imaginary conversations with the people he most admired at the time, including Louis XV, Madame de Pompadour, and Marie Antionette. Stepping a bit to the side of eccentricity or madness and into the realm of pure ego, Ludwig II’s Bedroom featured a bed raised upon steps in an alcove surrounded by a gilded balustrade – in the manner of an altar. The Night King slept soundly in his own holiness, and I’m sure any liaisons he had were uplifting and spiritual indeed. While the features of the castle shock, it is the gardens that astound. 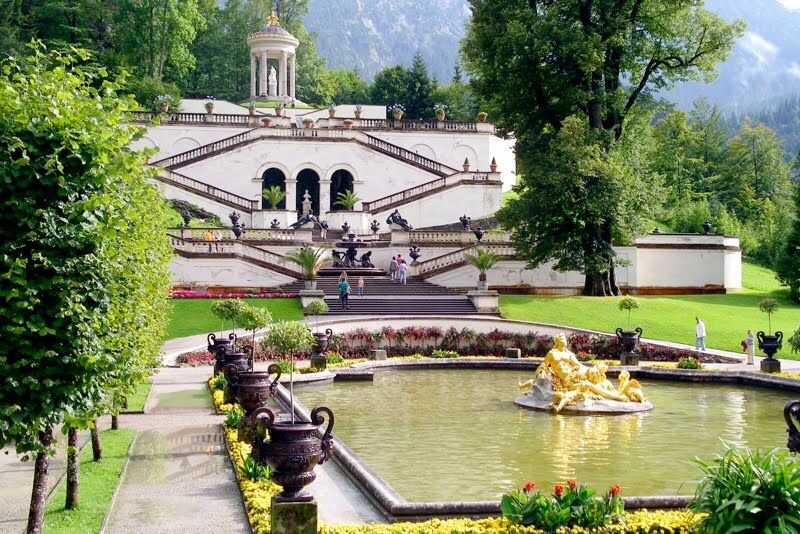 Here, too, is Ludwig II’s love of all things Wagner most keenly felt. 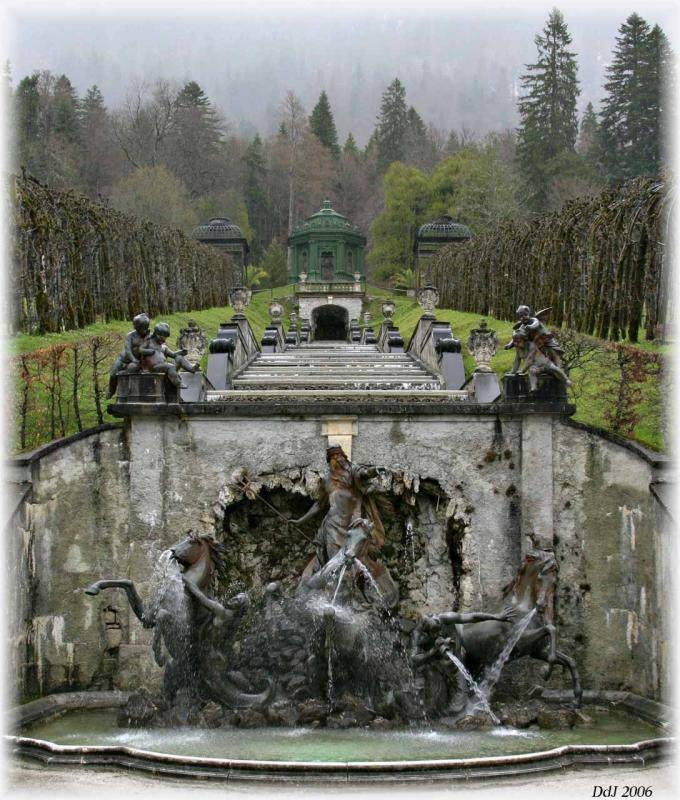 He ordered the construction of the Gurnemanz Hermitage (based on the character Gurnemanz of Wagner’s opera, Parsifal), Hunding’s Hut (from the character in the opera, Die Walküre, of Wagner’s Ring Cycle), and – we come at last to my favorite – the Venus Grotto (built as an illustration of Wagner’s Tannhäuser). 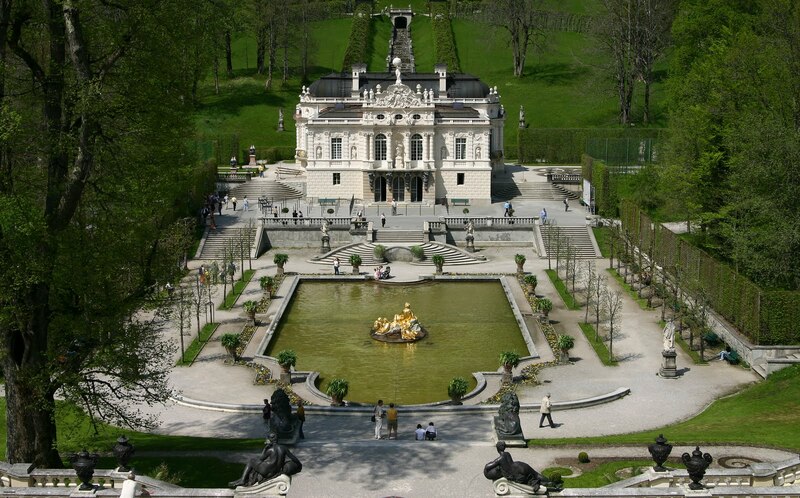 The Venus Grotto is an artificial stalactite cave, built at the behest of King Ludwig II. 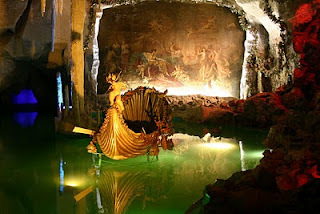 It features a grand entrance, an underground lake, and a golden swan-boat. Wanting his very own Blue Grotto (a famously colorful and naturally lit cave near Capri, Italy), the King ordered the installation of colored lights. 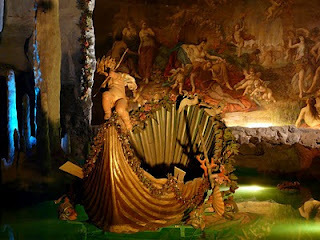 Believe it or not, the dynamo, or early electric generator, had been around for some forty-five years at this point and served to power the King’s colorful display. 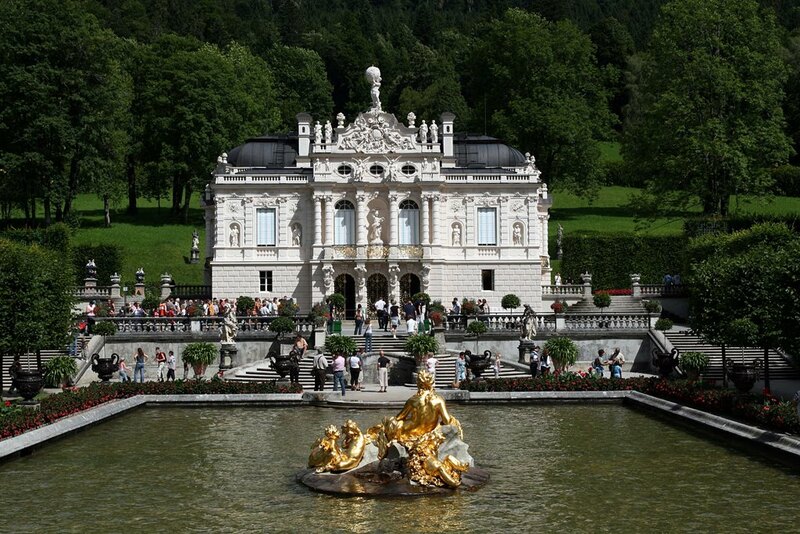 Ludwig II would escape to this incredible hideaway to be rowed around in his golden boat. Not a bad way to relax and daydream! I’ve always told myself that this is the kind of palace I would build (with secret passages, too! ), but as my friend, Joshua, reminded me: things like this are not built in these days. Ah, well, I can dream – and maybe get rich enough to make it happen anyway! What would you include in your dream palace? Where would you build it (woods, plains, desert, moors)? masterful output of the great artists. I love what you add to the posts when you comment. Thank you again! >Very interesting article and incredible images. Thanks! 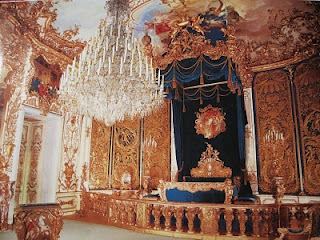 Many kings throughout history have been patrons of great artists similar to Ludwig and Wagner. Francis I of France was a great patron of Leonardo da Vinci (late in da Vinci's life), around 1515 – interestingly while Anne Boleyn was in the French court. Leonardo befriended Anne while she was there and apparently, she was quite devastated by his death. 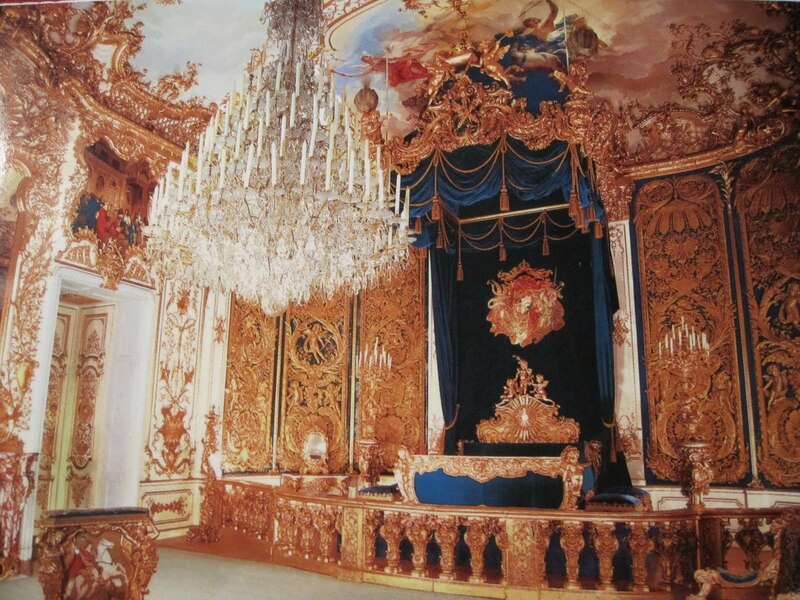 It's not surprising that Ludwig admired Louis XIV, who was also extremely ostentatious with his castles. >How magical. Thank you for sharing this with us. You brought this story to life with your voice and beautiful pictures. I'd love to spend time in Venus Grotto. 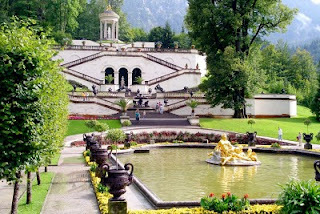 I know it's a moot point but still I wonder, was Ludwig II mad, genius, or a little of both? >Thanks Wade! I enjoy your articles very much. >Probably a little of both. And I'd love to spend some time there, too. Especially in the surrounding gardens. Thank you for the comment! >As much as the opulence can be a little disgusting, the art involved truly is fantastic. You're welcome, and thank you for the comment, June! 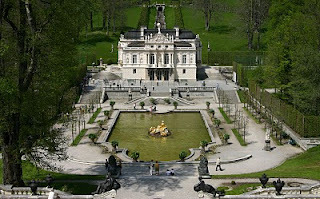 >i think that its pretty cool that im related to King Ludwig II. Its amazing to see what he had, and was able to do.